Ingrown toe nails can be caused by abnormally curved, damaged, fungal or thickened toe nails that grow into the adjacent skin. Shoe wear can also cause ingrown or painful nails. They are often easily treated conservatively by a podiatrist in the clinic rooms by gently cutting away the offending nail spicule and then educating the patient on appropriate shoe wear and nail cutting techniques to prevent problems in the future. 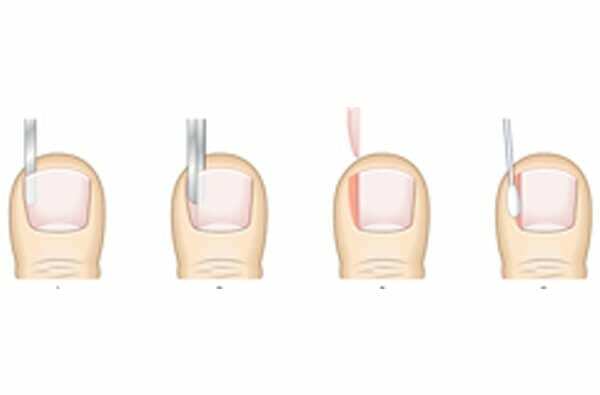 Nail surgery is a common and effective treatment for painful ingrown toe nails that are not resolving with conservative care. This may be suggested by your podiatrist if the problem is reoccurring regularly, causing ongoing pain or if the nail edge keeps becoming infected. The procedure is performed under local anaesthetic which numbs the toe that is being treated and the anaesthesia will last for 1-2 hours following the surgery. The procedure is conducted in the clinic rooms under strict sterilisation to minimise the risk of infection. A tourniquet is applied to the toe to minimise bleeding during the surgery. The offending portion of nail will then be gently trimmed away without the need to cut any skin. A chemical is then used on the root of the nail to prevent that section of nail from regrowing and causing problems in the future. The patient is able to walk straight away following the surgery however it is advisable to have someone to assist you to get home. Minimal pain relief medication is usually required however this can be discussed with your podiatrist. Dressings at home will also be discussed following the procedure. The podiatrist will then see you a week following the surgery to check on your recovery and once the toe has healed the nail will look normal, just slightly narrower than before. Having performed countless numbers of this type of surgery, you can be confident that you will receive the best possible care from the team at AC Podiatry.